I found these beauties at the DI. Apparently, someone was using them as Christmas lights I painted the eggs with pastel colors. Next, I sprayed some adhesive onto the eggs and rolled them in suguar (I saw this on another blog and thought it was a great idea). Next, I hot glued a piece of ribbon on the egg top. I then hot glued a button on top of the ribbon to give the egg a little somethin' extra. I am going to hang these on my blossom tree once Easter gets closer. 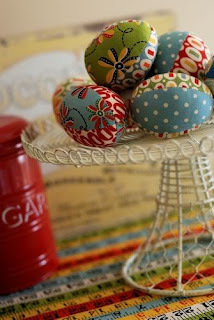 HERE is another cute Easter Egg idea. 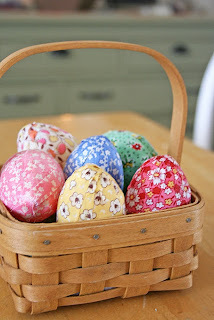 HERE are some more fabric eggs. I love your blog - just spent the last hour going through your old posts!! And what a small world you actually posted some of my valentines projects - the wood wreath with interchangeable plaques, valentine fence with hearts and be mine blocks!! I have so many things I have to try from your ideas - you rock!! !